Café Tacvba and Nortec Collective are headling the Jungle Live! concert, where they expect four thousand more spectators than last year. The 4th edition of the Festival Sayulita, Film, Spirits, Music & Vida, is ready to go from February 1-5, 2017—and it’s going to knock it out of the park. There’s plenty of heart and soul going into it as the goal is not only to promote this Magical Town and the Surfing Capital of the Riviera Nayarit, but also to raise funds for a future cultural center, this according to a recent press conference where they laid out all the details of this event. For starters, they’re expecting a crowd of anywhere from seven to eight thousand people. 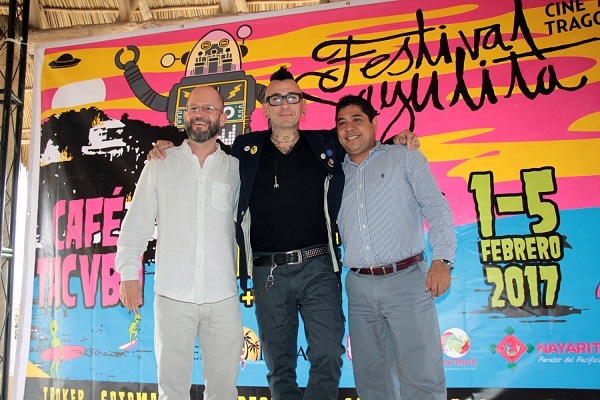 Festival organizers Gabriel Villarrubia and Alonso Aréchiga, together with Richard Zarkin, Public Relations Manager for the Riviera Nayarit Convention and Visitors Bureau, presented the updates for this year’s event and made it clear that nearly every event is free. The Jungle Live! concert is, without a doubt, the most highly anticipated event of the week, as it’s being headlined by the famous Café Tacvba along with Nortec Collective, Troker, Sotomayor, Burton and Sayulita’s Los Gatos Negros. They will take the stage at Las Quintas Trujillo and doors will open at 1 p.m. Tickets cost MX$490. The concert is on Saturday, February 4th. Over 50 features, shorts and documentaries will be projected on a giant screen on the beach. Everyone is welcome to this free event, though there are paid packages available for access to a sofa, food, drink or a souvenir. As happens every year there’s plenty going on in the culinary arena. Standouts include the Pairing Dinners on Thursday, February 2nd at 6 p.m. One of the concepts is to create pairings with Mexican spirits such as tequila, mezcal and raicilla, creating new libations and mixes. There are plenty of sports to be enjoyed as well, including surfing, Stand Up Paddle, boxing, races, riding, yoga and the famous Borracho FestStretch to get rid of the hangovers. Kids will also have their special day on Friday, February 3rd, with rock music and games made just for the littles. Check out the program, places, ticket sales and much more at Festiva Sayulita.